Green beans are a common vegetable that is widely available and generally inexpensive, so it's not difficult to add this food to your diet. Raw green beans provide a wide array of important nutrients, ranging from dietary fiber to the mineral fluoride. Eating raw green beans can also be convenient because you don't have to spend any time cooking the beans; just wash them, and eat. Eating raw green beans--or any vegetables--rather than cooking them can help you reap the full nutritional benefits. Cooking vegetables for long periods of time can reduce their nutrient content, while boiling can lead to the loss of water-soluble vitamins such as vitamin C, according to nutrition consultant Karen Collins, R.D. 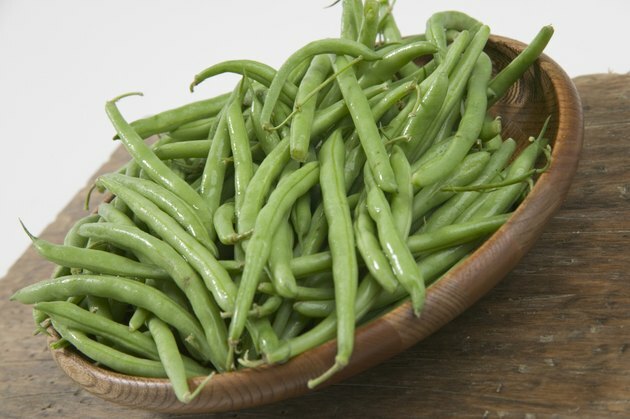 One cup of raw green beans provides 3 g of dietary fiber. Dietary fiber promotes digestive health, increases feelings of fullness and can help you manage your blood sugar and cholesterol levels, according to the Academy of Nutrition and Dietetics. The Institute of Medicine at the National Academy of Sciences suggests that men should consume 38 g of fiber daily, while women should eat 25 g. Thus, 1 c of green beans provides about 8 percent of the daily suggested intake for men and 12 percent of the daily suggested intake for women. A 1 c serving of raw green beans contains just 31 calories, which is less than 2 percent of the average daily intake of 2,000 calories. This amount is less than 70 percent of the calories in a cup of microwaved green beans. This is because green beans reduce in size when microwaved, so a cup of microwaved green beans contains more food than a cup of raw green beans. Raw green beans are rich in magnesium, a mineral that most Americans need more of, according to the University of Maryland Medical Center. Magnesium promotes proper health of your kidneys, muscles and heart, aids in producing energy and helps manage proper levels of other nutrients in your body. Raw green beans are rich in vitamin A, which helps you fight off infections and also maintains the health of your eyes and skin. Raw green beans are also rich in the vitamin A precursor beta carotene, which is an antioxidant. Raw green beans are also a good source of fluoride, a mineral that helps prevent tooth decay and strengthens your bones. Bitter Melon Gourd: More Nutrients Raw or Cooked? Which Beans Are Good for Diabetics?